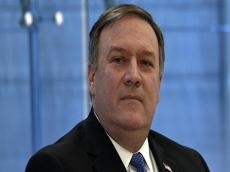 US Secretary of State Michael R. Pompeo congratulated Azerbaijani people on the occasion of Nowruz, said a message on the official website of State Department, Trendreported. "I would like to wish a Happy Nowruz to the people of Iran, and to everyone who celebrates this ancient tradition that marks the arrival of spring and a New Year, including people in Afghanistan, Azerbaijan, China, Georgia, India, Iraq, Kazakhstan, Kyrgyz Republic, Pakistan, Russia, Syria, Tajikistan, Turkey, Turkmenistan, Uzbekistan, and their communities in the United States," he said. Pompeo added that for millennia, Nowruz has endured as a cornerstone of culture and heritage for many peoples and societies. "Nowruz brings family and friends together to reflect on the past while celebrating the future, and is a time for connecting with loved ones both near and far. May this Nowruz bring new beginnings and a brighter future for everyone! Happy Nowruz!" he said.